Last weekend we decided to clear out the computer graveyard in our loft. Before taking them down to the local recycling facility we removed the hard drives and in doing so opened up a great learning opportunity for the boys. 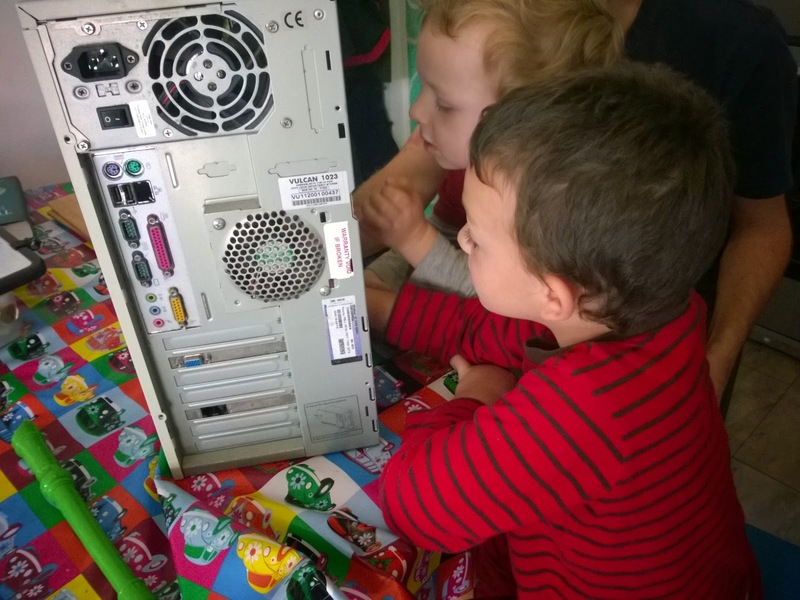 Modern tech is all so tiny it's hard for kids to get to grips with what does what, but the roomy space in an old PC Tower, with it's plug in boards, cables and fans is all a bit more explicable. We had a good poke around inside using a mixture of correct terminology such as 'Printed Circuit Board' and 'hard drive' with simple explanations 'this is the computers brain, it's where the instructions are to make it work'. 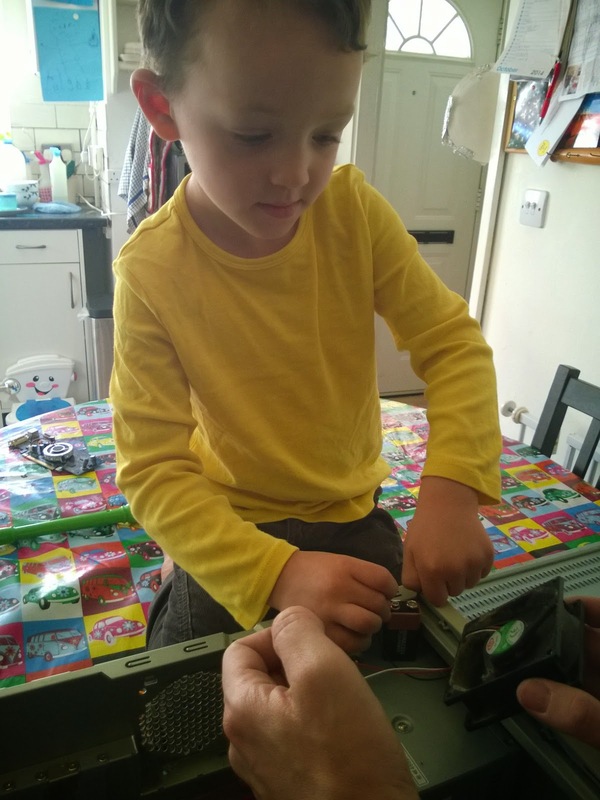 components such as the fans, and then both boys were hugely excited to be able to get the fans working using a 9v battery. Ollie was so enthusiastic about this that when he returned home from being at the allotment with Matt later on to find his grandparents visiting he rushed straight over to tell them about his fans and battery before he had even said hello to them. All this may seem like a contradiction to folks who know how keen I am to limit screen time and avoid tech dependence in the kids, but to me poking around with real electronics is a world away from sitting glued to a screen. I don't know how much the boys have taken in with regards the way computers function, but Ollie certainly understood that when the computer works it gets hot and needs a fan to blow the heat away, and that the fan can be made to work with electricity or by blowing on it - either way you are giving it energy. We also used it as an opportunity to remind them to stay away from electrical sockets, that the little amount of electricity in the battery is Okay, but the electricity in the socket is strong enough to really hurt you. Safety bit: as always, you know when your kids are ready for activities - if they're still putting everything in their mouths this is obviously not the activity for you yet. Batteries are especially something to be careful of as children can be seriously harmed or killed by swallowing batteries - the most dangerous are the small 'cell' type - you won't find these in an old PC, but it's something to bear in mind if you are looking at the innards of other equipment such as toys. Watch out also for sharp edges of metal housing in the PC case - these things are not designed as toys and are therefor inherently somewhat risky. Never dismantle equipment that is plugged in - usual common sense stuff. Don't do this activity if you think it will result in your kids trying to dismantle other things without you - it's worth really emphasising to them that you do this activity together and keep screwdrivers well out of reach the rest of the time. Learning opportunities: basic science such as how circuits work, fine motor skills in manipulating the screwdriver, language skills and vocabulary in describing together what you are looking at and what happens when you make a circuit with the fan and battery, working safely and home safety, self confidence and self esteem in spending time with an adult focusing on an exploration together.